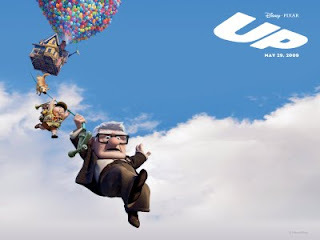 As a young boy, Carl Fredricksen had a dream, to follow the foot steps of his idol Charles Muntz as a great explorer. He shared this dream with a girl named Ellie whom she met in a dilapitated house. It then started a friendship that blossomed into marriage. Even though they have found out having a child is not possible for them they live contentedly in their house where they first met. They did not forget their dream to go to Paradise Falls in South America. Ellie become a zookeeper and Carl become a toy balloon vendor. They save every money they could so that they can fulfill of going to their dream place. But as time passes by, their savings had been used for other financial obligations that has to be taken care of. As they grow older, the plan has not been executed but not forgotten. When the time Carl was able to buy the tickets, Ellie succumbs to an illness due to old age that resulted to her death. This event left him devastated causing him to be grouchy. This time his house is already surrounded by construction of tall buildings because the city is already expanding. At one point, he had a confrontation with a worker who accidentally destroyed his mailbox. He then hit the worker causing a commotion taken by the developers as an opportunity to take him out of the way to expand their construction. Carl was then ordered by court to reside in a retirement home. Then came the day he is supposed to be taken to the retirement facility. Carl made his own plan of lifting his house with 10,000 helium filled baloons. Unknowingly, he had taken with him Russel, a Wilderness Explorer, whom he sent to a snipe hunt day before. This is where their adventure starts when they encountered thunderstorms that took them off-course. Russel, with the help of his GPS device, was able to to navigate the house to their destination. It was just at the opposite side of the plateau where they have been thrown of the house, and had to use their weight to keep them on the ground and walk the rest of the destination before the helium's effect on keep the house stay floating. 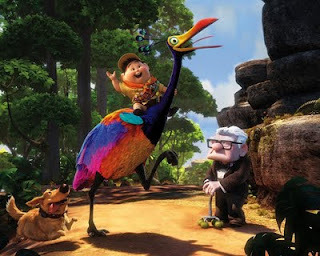 During their journey, they encountered a colorful bird whom Russel named Kevin. They also met Dug, a talking dog because of a collar, who befriended Carl immediately. During the course, they met Charles Muntz, who is willing to kill to capture Kevin. He even went far of burning Carl's house during their escape from him. Carl decided to proceed in his original plan of bringing the house making Russel angry about it. Upon reaching their goal, Carl found out that Ellie wanted her to have his own adventure after her death. This made Carl decide to rescue Kevin from Charles but Russel already left earlier. Together with Dug, they chased Charles' airship "Spirit of Adventure". They eventually rescued Kevin at the expense of the house floting down at the same time Charles plunging to his own death. They were able to take over the airship and go home for Russel's badge awarding ceremony. The movie is not just about some grouchy old man who lost someone he love and decided to commit suicide after making his house float. It is about the journey, adventure, friendship, love and family. 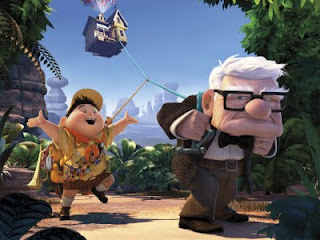 It shows how an old man like Carl Fredricksen, even grouchy, can be a friend to boy named Russel, who longs for a father figure. The movie is not just for children but also for adults. It is recommended to watch the movie with your grandparents. What touched me most is when Russel asked something to Carl then asked again to "cross his heart". This struck Carl because it is a line usually used by Ellie to him. Sometimes we usually find interesting traits of a friend or a love one with another person. I wish I find my own Dug but house space forbids. For now I will settle with 2 future garfields. Feel free to download the wallpaper from the movie, click to enlarge and right click and select "Set as Background" from the options.